When I think of teaching, I think of a roller coaster of emotions. There are so many ups and downs, so many great days followed by incredibly challenging ones. But it really is up to us whether we – as a whole – enjoy our time teaching or allow ourselves to be miserable. My first year teaching I really wanted to say that I was enjoying it. I mean, I had wanted to be a teacher for so long. It was my dream. Why was I dreading my first period class? Why did I find myself crying in a back hallway because I wasn’t ready to face the day ahead? 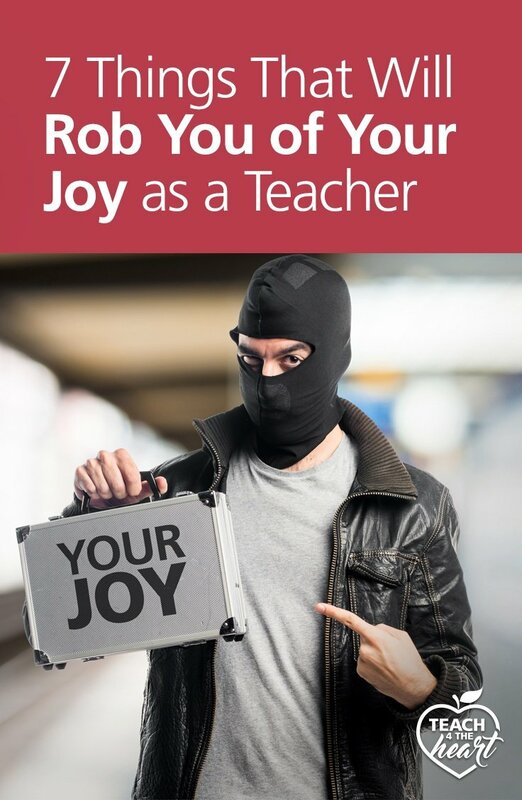 That first year was so challenging for me mainly because I made some serious classroom management mistakes, but that’s not the only thing that can rob us of our joy. Let’s take a look at a few others. Allowing your class to be out of control. When my class was out of control, I was miserable. It’s just tough to enjoy teaching when you feel like you’re fighting battles all day long. But the good news is that you can learn to control your class. We have a free minicourse that can help you get started. Or, join us in Classroom Management 101. Focusing on the negatives. There will always be challenges. There may even be big challenges or things that we just flat-out don’t agree with. But if we choose to focus on the negatives, we will lose our joy. Instead, choose to trust Christ and be thankful for all the great things that are happening all around you. You’ll be amazed how effective thankfulness is as an antidote for frustration. Exhaustion. If you allow yourself to become absolutely exhausted, you’re going to have trouble enjoying teaching. So make rest and sleep a priority. Schedule a nap. Go to bed early. I’ve learned that it’s just not worth it to try to get more done if I’m exhausted. Get some rest, and you’ll feel much more energized and probably actually end up getting more done in the long run. Taking on too much. Obviously as teachers there’s already a ton to do – it’s just part of the job description. But there are a lot of other activities that are optional. Coaching, volunteering at church, tutoring – activities like these are great to be a part of, but it’s not worth it if it’s going to take up too much of our energy and leave us exhausted and miserable. So learn to prioritize which activities truly are important and say no to the rest. Stress. We all know that stress can zap our joy in a minute, but we don’t always realize that we can control how stressed we are. Learn what helps you destress. It’s different for every person, but things such as exercise, making a to-do list, taking deep breaths, and praying help me. It's time to reclaim your joy! 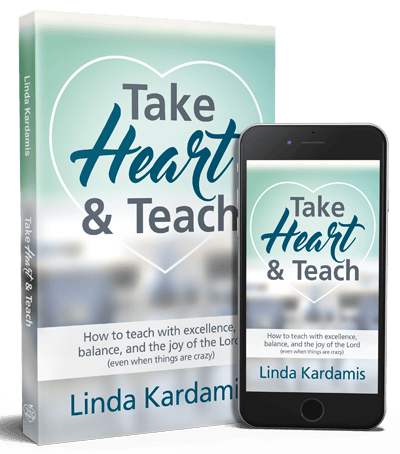 If you'd like further help and encouragement, grab a copy of my newest book: Take Heart & Teach. ​It's all about how to teach with excellence, balance, and the joy of the Lord - even when things are crazy. In it, you'll discover short, easy-to-read lessons that will help you better manage your classroom, find balance, overcome frustrations, and make a bigger difference than ever. Find out more about Take Heart & Teach. p.s. 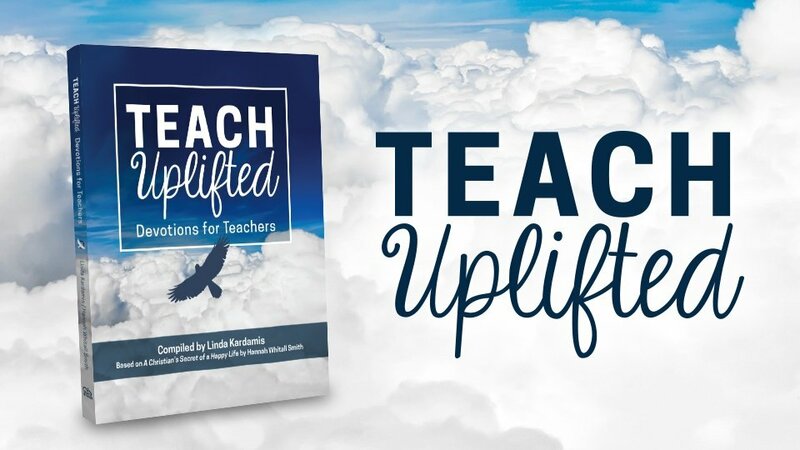 On the podcast I also mentioned our Teach Uplifted Program & the Teach Uplifted Devotions for Teachers book. You can find out more about both of those here. This is beneficial advice. If you are not religious like me, make sure you have a strong support group of teachers, family, and friends to confide in. My mom is a retired teacher and she makes a great sounding board when I’m overwhelmed. Thank you very much for all you do, you are a great person. Have a great week you too. God bless you. #5 is kind of interesting- I agree it is important to set your priorities but what I am finding is you can’t even consider much else besides school bc school requires everything. Is there a way to relieve the pressure and stress of being appraised? That is my #1 thing as a new teacher that steals my joy. I’m extremely sensitive to negative feedback, it’s so bad! I feel that the answer to your sensitivity to negative feedback is connected to how you feel valued. That is where knowing God helps. If you are living for the praise of men you will never be satisfied. But if you are living to love your God who loves you so much, the words of man mean less. Notice I said less because I still struggle with it but as I surrender everything to God the words of my administration, peers and even your students mean less. I find #5 interesting as well. First, while I am a teacher; I am a wife, a mother, a sports enthusiast, a church member and so much more than just a teacher. 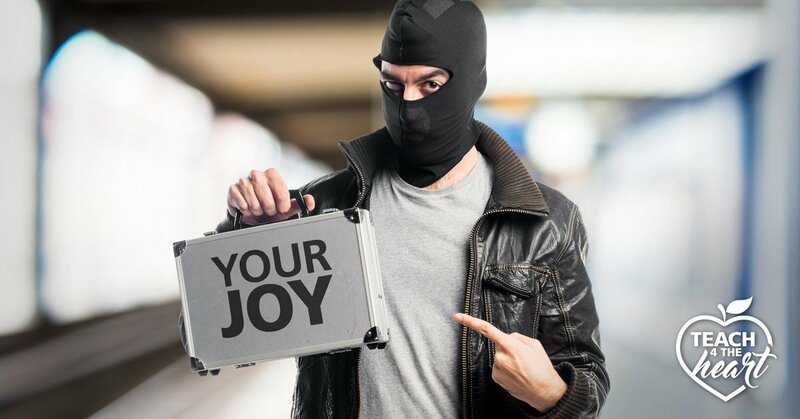 Not having time for those things steals my joy, therefore, I make time for those things over teaching in the evenings and on weekends when there are things I want to do. Secondly, in our school district things like tutoring, coaching, being on committees, sponsoring clubs, working at sporting events, etc counts as part of our evaluation process. You cannot simply avoid these things because they add stress or take up too much time. As a new teacher, even though I was not a twenty-something, I was super-sensitive as well, but overall, I knew that the advice I was getting from my non-Christian principal helped me become a better teacher. As far as evaluations and all the things we have to juggle, prayer, simple prayer, on the way to and from work will help tremendously. If there was anything I would add to this list it would be making sure to read the Word every day. God’s Word sustains me and helps me grow in wisdom as a teacher and a person. Focus only on things you can control. You can’t control what a child didn’t learn in previous years, what their home life is like, how parents will treat you, or how the school is run. You can only control what goes on in your classroom. Make each day count. This comment is very helpful to me as a new teacher. Focusing on parents, school boards, or home life of students can be so draining . Being a teacher has shown me all my warts and prickers and has driven me to my knees for strength and support from God. What a learning experience this has been!! So thankful I found this website! I do not work with a lot of believers and often feel alone in my journey as a Christian teacher. I love the encouragement I’ve found on this site! #5 is probably my biggest struggle as a wife, mom, and teacher. I’ve found that when I do have my priorities straight, I’m a lot less stressed. I’ve been thinking about focusing on positive happenings in my class instead of always stressing about how to fix the problems. I think I tend to let the problems overshadow all the good things that happen. Staying away from negative discussions is huge for me too! I feel worse after hearing a lot of “dirt”. Sometimes, team building activities in my classroom are less about the kids and more about the teacher. Kids get stressed out just like adults. Sometimes when things aren’t going well, it is time for a reset in your classroom. Planning activities that can let our hair down for a few extra minutes or that will give us back a sense of common ground can be just want the doctor ordered to get our class chaos and control issues controlled. When I see that my kids are getting out of control, sometimes it is less about what I’m not doing and more about where they are. I teach in a school with really high rigor – all core classes are pre-AP or AP classes. The work load is only compounded second semester as a majority of my students start college classes as freshmen in high school. Sometimes we all need brain breaks to release the tension and get back to even keel. I started this post by saying it was more about me, the teacher. During second semester, I start to face the burn out of the same students doing the same things. I need to see my students in a different light. I need to remember they are humans who don’t just turn work in late or whatever other trait is getting under my skin at the moment. If we can team build, it reminds me of their other shining qualities and I can come back to center and keep going til Spring break! I am a seasoned pre-k teacher and have loved it through criticism and difficulty. But, this year has been devastating both physically and emotionally. The stress is so bad that I have developed facial tics. I am a Christian and trust God daily to get me through each day at school, but exhaustion keeps me from doing virtually anything at home. Parents are my greatest difficulty. Their expectations are way over the top, and they do not like to hear anything but praise about their child. A parent complained to our director that I was negative about his child simply because I told them that I felt like the child would benefit from a hearing test. The straw that broke the camels back was when one parent flat out said that her child acts the way he does because I don’t pray for my students. This completely devastated me. I need encouragement in a reset. I get focused on doing everything the ‘right’ way that when it’s a process, I have a hard time starting it. My principal is awesome but I am overwhelmed with where to start and feel like I don’t have time to really sit down and make a plan. When I know what to do, I become afraid that if I don’t get it right or am vigilant enough that all my progress will be lost, I won’t be successful, etc. I feel like I’m trying to just survive and do the best I can, but my anxiety seems to get in the way every time. I still struggle with #1 even after taking classes. I put in a system that I can do and admin didn’t back it up. I put in the system admin liked and I failed. It feels like the one area I pray and seek His help and wisdom on the most and yet hear nothing.